George Townshend lived in and around Lewes (Bonfire capital of the World) in East Sussex, except for a brief spell at the end of his life when he lived in Southampton. He was variously a farm worker, railwayman, soldier, and railway policeman and messenger. He lived from 1882 to 1967, five years before I arrived in Sussex, so my previous knowledge of him before this CD was confined to a few recordings, some articles and snippets. Happily, Brian Matthews, who lived in Brighton in the 50s and 60s, developed an interest in English traditional singing. He bought a small tape recorder and plugged himself into the network of singers and enthusiasts then active in Sussex, which included George Spicer and Pop Maynard. This CD presents some of Brian's recordings made on a 5" spool Stellaphone domestic machine in 1960 and 1961. Rod Stradling comments that 'the sound quality is not as good as I would wish - but I hope it is adequate'. It certainly is: any deficit in the quality is made up by the twenty-five tracks which include some cracking performances and give a fascinating insight into the repertory of a singer who enjoyed his singing and saw himself as a performer. George Townshend's voice could be described as a lyrical tenor (which does not imply that he adopted the mannerisms of classical singing). His pitch is generally very secure; his phrasing is impeccable and highly musical. Like many traditional singers from the south of England there is little overt decoration but he makes use of slowing and speeding to give the unaccompanied songs life and interest. This is an obvious characteristic in the song that is most widely associated with him The Echoing Horn, but it is there in most of his songs. Through sheer enjoyment, he sometimes leans on a note giving it an extra emphasis (one is reminded of Charley Parker's 'pretty notes'). George Townshend's singing is practised. He sounds as if sang his songs through quite regularly. The songs on which he duets with his granddaughter, Angela, prove this point. The chorus of Twenty, Eighteen … and a full text of Joe the Carrier Lad are sung in near perfect unison, an interesting example of songs being communicated between generations and forming an obvious bond. The singer's repertory contains a lot of the common stock of country singers active during the last century. As one would expect, there is a significant overlap with the repertory of the Copper Family, who were one-time singing companions of Townshend. Such pieces as When Spring Comes In (aka The Spring Glee) Twankydillo, and Dame Durden remind us that the Coppers were part of a widespread singing tradition they shared with numerous other singers. Also among these songs in common is The Trees They're all Bare, a wonderful evocation of winter which seems to be pure Sussex - I have never come across it from other parts of the country. But George also had songs which I had always associated with other parts of England: We'll All Go A-Hunting Today I had only heard from the north and Twas Early one Morning (Dido, Spendigo) I had never come across in a version from Sussex before. Singers often like particular types of song and George obviously had a liking for hunting songs. He performs them with great aplomb including a full set of Bold Reynolds in beautifully measured five time that swings along superbly. There are some unusual items in George's repertory. It could be argued that his repertory is older than other singers who remained active in the twentieth century. He was learning songs in the latter years of the nineteenth century and his less usual pieces may well be those that have dropped out of other singers' memories. The minor tune to I Wish They'd Do It Now (a surprise this in an otherwise entirely major mode set of songs) is not the raucous polka beloved of southern English instrumentalists, but a rather unusual and fine melody, which George has a little difficulty handling and which lends the words more dignity than they deserve! George knew some rarely collected songs. His The Garden Gate is the only known recording of what would seem to be a nineteenth century song. I had seen the rather cynical I Mounted my Neddy on ballad sheets but never hear it sung before. Hark, the Rock has the poetic aspirations of many Victorian parlour ballads, but is a wonderful example of its genre. The Bricklayer's Dream, a fragment of which appears on a final compilation track, has been little collected and I do not think I have heard a recording of it from a traditional performer before. No note on this song appears in the otherwise generally excellent booklet [A minor aberration; it does now - Ed.]. Other fairly unfamiliar songs include Pretty Nancy From Yarmouth in a moderately complete version and Young Collins, which I think I remember Bob Lewis singing and which has an unusual verse structure. People who enjoy English traditional singing will want this CD. Others … well who cares about them! I am struck by the irony that when I first took an interest in traditional song it was very hard to get hold of recordings of traditional performers. Now, we are almost awash with them. Recordings, to me, are only ever second best, but in the absence of direct access to performance, they are welcome. 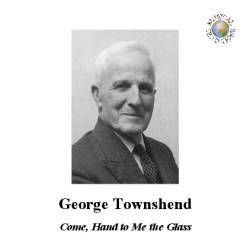 I am pleased to have encountered George Townshend through these recordings, even though I would have liked to have met him and experienced his music directly.